The name Thomas means, "twin." He was one of the Twelve, a Galilean by birth. Sophroneus (not the famous Patriarch of Jerusalem [7th Century, celebrated March 11], but a friend of Jerome's), quoted also by Jerome, says that Saint Thomas preached to the Parthians, Pesians, Medes, Hyrcanians, Bactrians, and neighbouring nations. 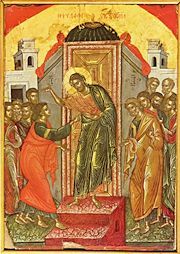 According to Heracleon, the Apostle died a natural death; according to other accounts, he was martyred at Meliapur His tomb was known by Saint John Chrysostom to be at Edessa in Syria, to which city his holy relics may have been translated from India in the fourth century. Share the feast of The Holy and Glorious Apostle Thomas with an icon greeting ecard.